For many of us, we find this excruciatingly painful. Here are some suggestions. Sticking up for yourself might feel uncomfortable at first but you’ll get used to it. Be sure you really want to say no first. Is the thing you’re saying NO to unfair or unreasonable? Or do you just not want to do it? It makes a difference. If you’re not sure, don’t make a rash decision. You can always ask for more time to respond or ask for clarification of the request. If you decide to say NO, say it briefly and clearly. Don’t over-explain or go on and on trying to rationalize your decision. This could be used to talk you out of it since you will come across as being indecisive. Don’t be coy with words; use the word "no". "No" is more powerful and clearer than "Well, I just don't think so..."
Make sure your body language is in line with your words. Often we unconsciously nod and smile when we’re actually saying “No”. It gives mixed messages. Shake your head when saying "no". Say "I won't" or "I've decided not to" rather than "I can't" or "I shouldn't". People can be very persistent. If the person keeps asking, repeat your original refusal. It’s not necessary to come up with excuses. For example, keep saying “No. I’ve decided to stay in this weekend” – you might shift your tone of voice or emphasise different words but stick to the message. You might want to acknowledge the other person’s feelings about your decision, but avoid saying ‘sorry’, it puts you on the defensive and puts blame on you where it’s not necessary. You could say, “I understand you might be disappointed, but I’ve decided to stay in for the weekend”. If they still persist, try silence (easier on the phone), along with good body language. Try changing the topic of conversation. If they become angry, don’t react, stick to your decision calmly and quietly. You could end the conversation; you have a right to do that, e.g. “I need to go now”. Avoid feeling guilty. It is not up to you to solve others' problems or make them happy. If you do not want to agree to the person's original request, but still desire to help her or him out, offer a compromise: "I will not be able to babysit the whole afternoon, but I can sit for two hours." 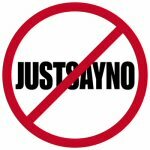 You can change your mind and say "no" to a request you originally said "yes" to. All the above applies to your change of mind.